ABOVE: Large double-deck boats stop at the Lido on their way from Punta Sabbioni to Venice's San Marco waterfront. The local No. 1 vaporetto is the most popular way to reach the historic center of Venice; it calls at more than a dozen stops between the tip of S. Elena and the Piazzale Roma on the Grand Canal. Allow 15 minutes to S. Zaccaria (near the Piazza San Marco), 39 minutes to Rialto, 53 minutes to Ferrovia (the railway station), and 56 minutes to the Piazzale Roma. The 5.1 and 5.2 circular routes offer quicker service to the railroad station and the Piazzale Roma. Allow 44 minutes to the railroad station and 48 minutes to the P. Roma on the 5.1; the 5.2 is slightly faster at 34 and 38 minutes. ACTV's big double-decker boats runs directly from the Lido Motonave pier to Venezia Pietà, one of the piers at S. Zaccaria by the Piazza San Marco. Travel time is 14 minutes. 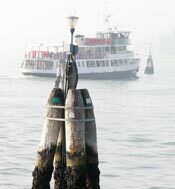 See our Venice Vaporetto Routes article for more information.